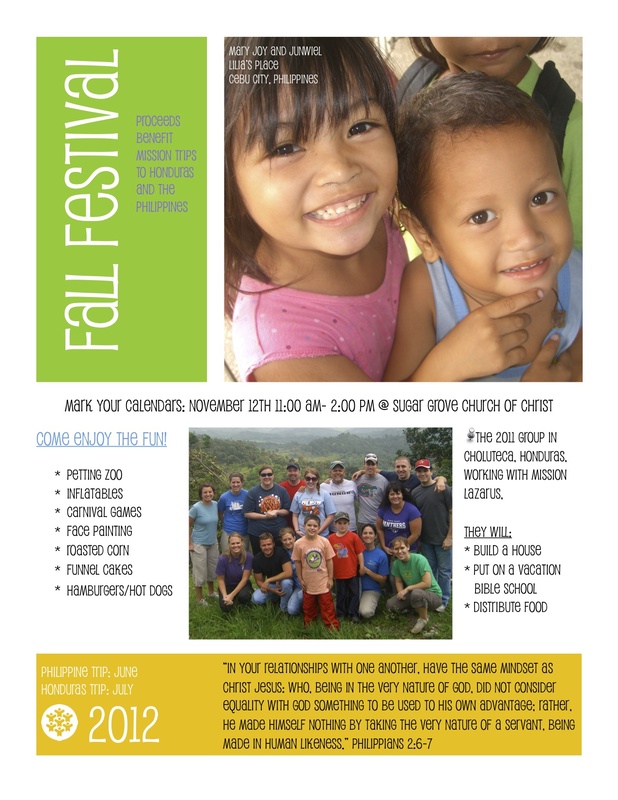 On November 12th, we are having a fundraiser to help support our Honduras trip this summer. Last year was an absolutely amazing experience, and I hope this year is even better. The festival will be at Sugar Grove church from 11am-2pm. There will be lots of fun games for kids! Come out and support us! 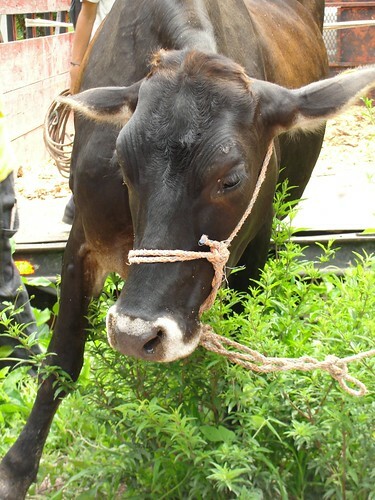 While in Honduras, we were able to give a family a cow. We were actually able to purchase 2 cows, but we delivered one. The special thing about this cow, is that it was pregnant! 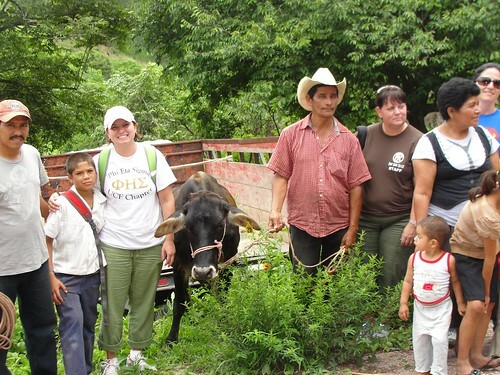 Which means, we not only gave this family a cow, but a cow they can pass on to their children. Maybe one day, that cow will have a baby and that cow will have a baby. This is money well spent people! The family is chosen by Mission Lazarus based on different criteria, one of course being need, but also on how they will distribute milk. 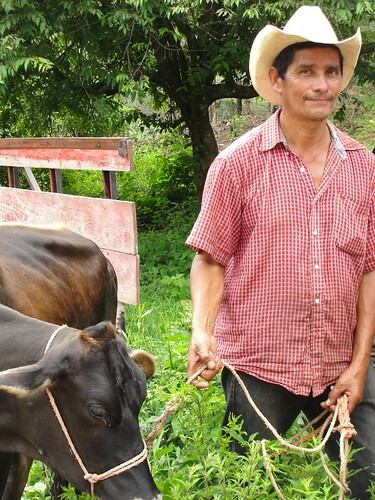 A cow produces about 10 liters of milk a day, and this family will only need about 3 of those liters. The other 7 they have to share with their neighbors. 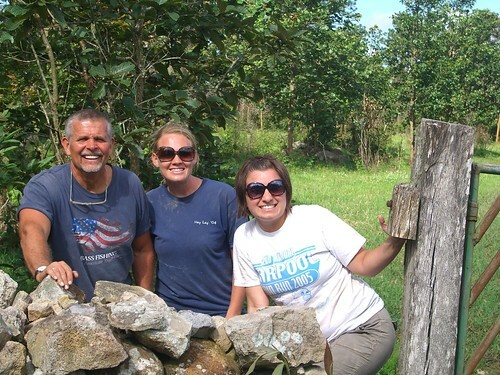 Mission Lazarus chooses families to help which in turn will help other families. I was blown away by the organization, Mission Lazarus does good work well – what I mean by that is they have a lot of donors to keep happy. Because they need to keep people happy, they help people in an organized manner, a manner in which they can provide proof to donors, and they start a mentality of paying it forward. Clearly, I’m a fan of the organization. The cow was the only one not so happy about the situation. After we delivered the cow, we got the van stuck on this hill. We tried many different ways, but finally we pushed it! It was exhilarating to push a stuck van out. There were many points during this trip when I thought about how strong we really are, and about how I don’t use my strength. Shoveling, hauling bricks, digging holes, and pushing vans aren’t normal activities for me. They are activities that I can do though, and I feel empowered by that. I’m strong. Not only did I learn I was strong from this cow, I also learned a thing or two about money. This cow cost roughly $800, which sounds like a hefty sum, but I’m pretty sure I spent $800 on clothes last year that I didn’t really need. We do live in a different society, but we can still do a lot with our money. I am in no financial position to donate a cow, but I am in the position to think more consciously about where my money is going. So, with school kicking off, and the need to spend is getting at me, I’m going to live frugally in August. That is my happiness project goal. You can truly learn a lot from a cow. This summer I was able to cross something off my life list, in doing so, I found many more things to add and to think about. Here here to Honduras! My First mission trip! On our drive to the work site we passed the border between Honduras and Nicaragua. We made sure to hop out and take a picture in another country! This was my second visit to Nicaragua. My first visit to Nicaragua was unexpected. My small group was distributing bags of food to families when Sergio, our leader, got out of the truck, opened a gate, and waved us through. Then Sergio let us know we had entered Nicaragua. We were a little unsure about this, because there wasn’t anyone to stamp our passports or check our bags. So, we blindly went along for the journey. We drove until the rode was no longer passable and we then got out and walked. And then we walked. And walked some more. We walked for half an hour before we even saw a house. I thought surely this most be the house, but then we walked past that house. The path narrowed and we walked single file. We began to fish around for our snacks and water as Craig and Josh carried fifty pound bags of food. Eventually we arrived at house, it was very small, with a concrete floor, a hammock, and three small rooms. We presented our bag of food, and it is hard to explain exactly what that felt like. It is hard to say, “Here! Be happy! We brought a little food!” Truly, I wanted to cry and apologize that it wasn’t more. I wanted to buy shoes and clothes and beds and whatever else I could and drag it down that path to that house. But, that isn’t an option. It was a small gift, but it does help. I have to remind myself that I can’t do everything. I have to remind myself that every little bit DOES matter. It truly truly does. We went on to go a little farther down the path to one more house. 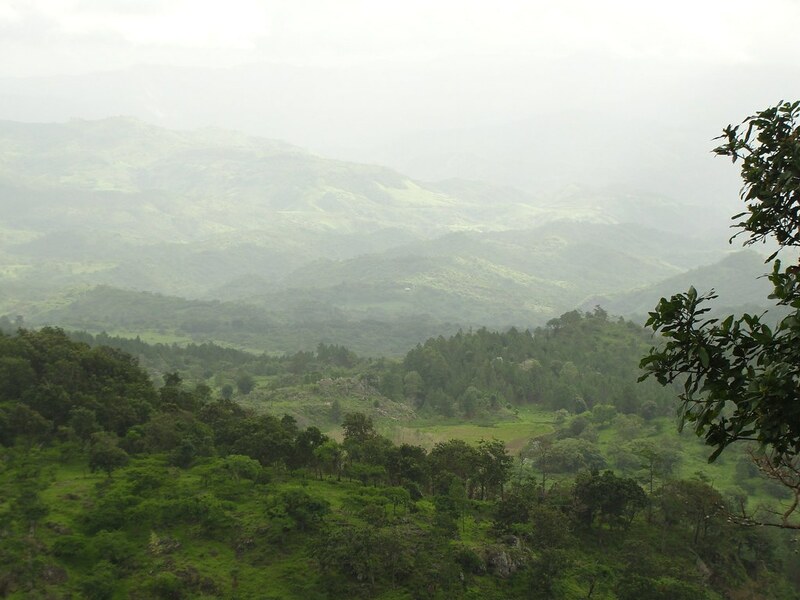 Our walk to Nicaragua was a vessel for thinking about what delivering food means and looks like. I thought a lot about the throwing back a starfish story, helping one starfish and helping one family can and does make a difference. The day my group walked to Nicaragua we handed out 10 bags of food, and others in group passed out 10 bags per day for the next two days. It may not be a new house, or food for life, or a long term help. But I have to remind myself that we did bring food to 30 houses, and that means something. The walk to Nicaragua represents to me a change in thought. I need to focus on what I can do today to help someone, not that I am unable change their lives forever. I was wrong about the fear. There is no reason to fear! I always feel that way after the fact, but really? Why must I waste my time? Honduras was a great trip, I had a marvelous time, I grew as a person, I never got lost, was never hungry, and never felt scared. I could have spent the time and energy spent worrying doing something else. The thing is, will I spend that energy differently next time something scary comes along? I would love to say I’ve learned! No way will I fret my time away again! Honestly, I am who I am and my natural state is as a person who frets. I have a lot to say and am at a loss for where to start. For now, I’m having difficulty uploading pictures. There is probably some easy fix that I can’t see at this point. I’ll fiddle now and will hopefully have a decent post shortly….